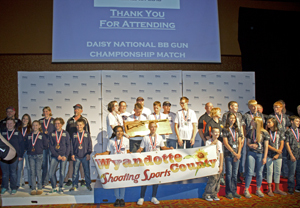 Daisy Outdoor Products and other organizations annually sponsor the Shooting Education Program to teach young people gun safety and introduce them to the sport of shooting. For information on finding a youth shooting sports program in your area look in the FAQ section. We have a discussion board for coaches and parents to share information and ask questions and get asistance from other coaches. It requires joining and to keep members from being spammed, Dwight Watt will approve requests to join list and also first message sent will pass thru him for approval and then you will be able to post messages and not be reviewed. This is for protection of members of the discussion board. You will have the option when signing up to receive each message as sent, or in a digest summary form. This option can be changed later. Send an email to Dwight if you have questions about the discussion board. You may get an error page trying to subscribe. I am trying to figure out code to get around this. Send Dwight and email and he will have an invitation sent to you for the discussion board.